Box Text: DESTROY THE EVIL IN "THE WORLD"
The year is 2017, and servers of the popular video game "The World" are infected with a dangerous entity. You must hunt it down and destroy it. With new fighting abilities, new weapons, and new environments to explore, you won't want to log out of "The World" again! Unique and epic storyline in a simulated MMO! Customizable weapons and advanced AI! 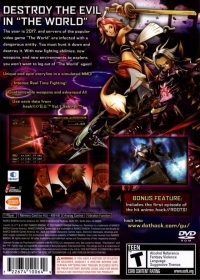 Use save data from .hack®//G.U.™ Vol.1: Rebirth™! Includes the first episode of the hit anime .hack//ROOTS! 07-26-2015 egen Box Text DESTROY THE EVIL IN "THE WORLD" The year is 2017, and servers of the popular video game "The World" are infected with a dangerous entity. You must hunt it down and destroy it. With new fighting abilities, new weapons, and new environments to explore, you won't want to log out of "The World" again! Unique and epic storyline in a simulated MMO! Intense Real Time Fighting! Customizable weapons and advanced AI! 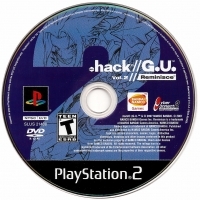 Use save data from .hack®//G.U.™ Vol.1: Rebirth™! BONUS FEATURE: Includes the first episode of the hit anime .hack//ROOTS! This is a list of VGCollect users who have .hack//G.U. Vol. 2//Reminisce in their Collection. This is a list of VGCollect users who have .hack//G.U. Vol. 2//Reminisce in their Sell List. This is a list of VGCollect users who have .hack//G.U. Vol. 2//Reminisce in their Wish List.